Authorities have reported 6 additional deaths in a Northern California, raising the death toll to 29 and making it the deadliest wildfire on record in California history. Butte County Sheriff Cory Honea said the human remains recovered on Sunday included five bodies found at homes and one in a vehicle in Paradise. He also announced that 228 people remain unaccounted for since the fire began Thursday and incinerated the foothill town. The statewide total of deaths from wildfires reached 31. Authorities say 228 people remain unaccounted for after a deadly wildfire ravaged a swath of Northern California. Butte County Sheriff Cory Honea announced the figure Sunday night, raising the number of people missing by more than 100. Southern California Edison has reported to state utilities regulators that there was an outage on one of its electrical circuits near where a large and destructive wildfire began as strong winds swept the region. SoCal Edison says the report to the Public Utilities Commission was submitted out of an abundance of caution although there's been no indication from fire officials that its equipment may have been involved with the start of the fire. The utility's report says the so-called Woolsey fire was reported at approximately 2:24 p.m. Thursday, two minutes after the outage on a circuit from a substation. Similarly, Pacific Gas & Electric notified regulators there was a problem on an electrical transmission line minutes before a wind-driven fire erupted in Northern California on Thursday and destroyed the town of Paradise. Fire officials believe no additional structures have burned in the huge wildfire west of Los Angeles. Los Angeles County Fire Chief Daryl Osby said Sunday evening he expects to have a better damage assessment on Monday and expects the number of lost structures to be greater than the last count of 177. The return of gusty Santa Ana winds Sunday caused flare-ups, but Osby says the 130-square-mile (337-square-kilometer) fire stayed within its perimeter. Mandatory evacuation orders remain in effect in the areas of the fire in Los Angeles County while neighboring Ventura County expects to lift some evacuations Sunday night. Officials also say two people found dead in a car earlier were both adults. Investigators believe the driver may have become disoriented and the vehicle was overcome by fire. Some 3,500 students continue to shelter in place at Pepperdine University on the Malibu coast. The university has canceled classes at the Malibu campus and at its Calabasas campus to the north until after Thanksgiving. Robin Thicke's Malibu home was destroyed while Caitlyn Jenner's was spared in a Southern California wildfire. A Thicke representative says Sunday that Thicke's house had completely burned down. Jenner posted an Instagram video late Sunday saying their house made it, but described the scene in Malibu as "devastating." Actor Gerard Butler said earlier Sunday that his house was "half-gone" while "Real Housewives of Beverly Hills" star Camiller Grammer Meyer lost her house entirely. Actor Gerard Butler and Camille Grammer Meyer of "The Real Housewives of Beverly Hills" are among the celebrities whose homes have been damaged or destroyed in a Southern California wildfire. Butler said on Instagram that his Malibu home is "half-gone," and shared a photo of himself standing in front of a burned-out section of the house and a badly burned vehicle. Meyer's publicist Howard Bragman confirms that her house in Malibu was destroyed Saturday night. He says she's grateful to have safely evacuated with her family, is appreciative of firefighters who have risked their lives fighting the blaze, and is grateful to the love and concern shown for her. Jordan said two shelters told her that evacuees were coming in so fast that officials there couldn't keep up with a roster and were instead directing inquiries about loved ones to a Red Cross database. "We figured it's better to drive down and look for them," Jordan said in a telephone interview Sunday after crossing into California on her roughly 700-mile (1,000-kilometer) drive. "I heard on Twitter that all the shelters within a 75-mile (120-kilometer) are full." A mobile home community has suffered significant destruction from Southern California's huge wildfire. Nancy Breeding said Walker's husband Lon was at work and had called a neighbor to knock on the door to get his wife to evacuate, but it's unclear whether she was alert at the time. Breeding said Walker's family had assumed she escaped the inferno until authorities confirmed her death late Friday. Councilman Skylar Peak said Sunday that colleague Jefferson "Zuma Jay" Wagner suffered burns trying to save his home, which burned down. Huge plumes of smoke are rising again in the fire area, which stretches miles from the northwest corner of Los Angeles' San Fernando Valley to the Malibu coast. Teague has called two hospitals in the area in her search for Herb Alderman, but there was no sign of him. She called a third hospital but learned it had been destroyed in the fire after all patients were evacuated. She even called the coroner's office. After answering the phone on the first ring, Teague told a reporter she hopes a friend picked up her stepfather and took him to a shelter. However, Teague's brother has checked several shelters, and not found him. She said it's been tough doing the search but is still holding out hope. California Gov. Jerry Brown is requesting a "major disaster declaration" from the president for the wildfires burning at both ends of the state. Chico police are searching for a man who stole a firefighter's uniform shirt and then tried to sneak into his hotel room. California Highway Patrol Lt. Denis Ford said Saturday that the thief broke into a marked fire department pickup truck from one of the numerous agencies fighting the fire that devastated the Sierra Nevada foothills town of Paradise this week. He stole items including the uniform shirt marked with the firefighter's last name Saturday. The thief then wore the uniform shirt as he tried to talk a Chico hotel clerk into letting him into the firefighter's room, using the last name. But Ford said the clerk grew suspicious in part because he couldn't fully identify himself and he fled without being arrested. "It definitely grew and it definitely grew in those areas," said fire Capt. Bill Murphy, a spokesman for California's firefighting agency. "It didn't grow as much as we thought it potentially could based on the weather forecasts, but the wind will continue ... so that potential still exists." High, gusty winds predicted from Sunday into Monday morning mean another 24 hours of "red flag" conditions that could spark "explosive fire behavior" of the sort that leveled Paradise and other Sierra Foothill communities Thursday, he said. The Camp Fire in Northern California's Butte County has killed 23 people and is the third-deadliest on record in the state. 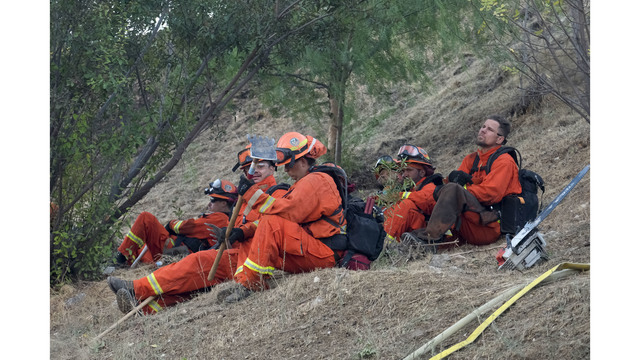 Conditions for firefighting in Southern California were favorable overnight and progress was made, but that's expected to change. The count of lost structures in both fires has reached 179, but that's expected to rise as damage assessments continue.